Boston, Massachusetts, in the 1760s was a hotbed of radical political activity and the scene of constant violent protest against British colonial policy. Much of the credit for the Revolutionary stance of Bostonians belongs to Sam Adams and a group that came to be known as his “Sons of Liberty” (or the “Boston Mob” as some called them). Adams, a Boston attorney and John Adams’ cousin, hardly seemed like a revolutionary. revolution. “He had a sunken chest, a sallow complexion, and ‘wishy-washy gray eyes,’” wrote one historian, and his “lips twitched and trembled, for he suffered from palsy.” Financially, he was a loser: he dressed poorly and earned little. Concerns over property rights rapidly led Adams to a position of opposing British imperial policies, and turning him into a fiery radical and rabble-rouser. He organized political opposition to the British in the Massachusetts colonial assembly and soon became the colony’s most effective Revolutionary propagandist. Nor did Adams confine his activities to non-violent polemics. 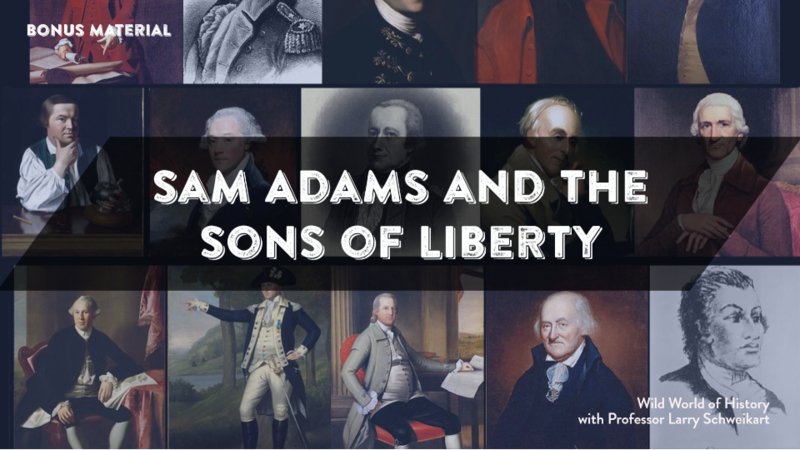 One of the most fascinating aspects of Adams’ career was his organization and leadership of the Sons of Liberty. Adams contended that the colonists had to oppose British tyranny dramatically—even with violence. He and members of the “Loyal Nine,” a secret group of Boston radicals, welded together a corps of husky South Boston “bully boys” to perform some of the more unsavory revolutionary tasks, including intimidating tax collectors and threatening British officials. Mob violence had always plagued Boston, but now the rioters attained a political role, which brought with it a certain revolutionary legitimacy. The Sons of Liberty were under the direct command of Adams, who called the Mob out whenever he determined that a British action demanded a protest. Early on, he learned a trick of modern political protestors by making the riots appear spontaneous. Of course, Adams controlled them with precision, and aimed actions only at Royal officials, politicians, or tax collectors. The Mob burned Royalists in effigy from the “Liberty Tree,” stoned their houses, and tarred and feathered customs collectors. When Tory John Robinson was married, the Sons of Liberty surrounded his home on the honeymoon night, broke out all the windows, and shouted obscenities at the newlyweds until dawn. With respects to the Lieut. Governor’s House, where they ended their vile [transactions]…they had rais’d a greater Number and were intoxicated with Liquor, broke trio Windows, threw all his furniture out of kilo House, stamp’d upon the Chairs, Mahogany Tables, very handsome Large gilt-framed Pictures, the Pieces of which lay in Piles in the Street, open’d his Beds and let all the Feathers out, took ten thousand pounds in Cash, took all his Cloathes, Linnen, Plate, and everything he had, cut the Balcony off the Top of his House, pulled down all the Fruit Trees in his Garden, and did him in all 25,000 pounds damage. Adams and the Sons of Liberty continued their activities until Independence was declared in 1776. The British government simply could not cope with the hundreds of rabble-rousers who took part in these riots, and after British troops fired on snowball-throwing civilians in the “Boston Massacre” of 1770, the image of the Royal Government dropped beyond redemption. Adams also likely played a role in organizing the band of “Indians” that held a “tea party” in Boston Harbor in 1773. By 1775 the American Revolution was inevitable. The battles at Lexington and Concord were simply formalized versions of the resistance that had been going on in the streets of Boston for 10 years. The Sons of Liberty introduced violence into the British-American dispute and made reconciliation impossible, which was Adams’ goal all along, namely to alienate the moderates and make them choose sides. Events also revealed that “news” and “propaganda” often were one and the same, depending on who did the “reporting.” With that strategy in mind, Sam Adams and the Sons of Liberty proved that rioting, looting, and violence—disgusting as they often were—could be effective Revolutionary tools. John C. Miller, Origins of the American Revolution (Boston: Houghton-Mifflin, 1943), quotation on 135.